I thought I'd share with you my typical Saturday lunch. Some of you may find it a bit grotesque, but I don't care. Saturday lunch always forms itself from whatever happens to be in the fridge or in the cupboard prior to our trip to the grocery store. This Saturday's lunch was particularly weird. 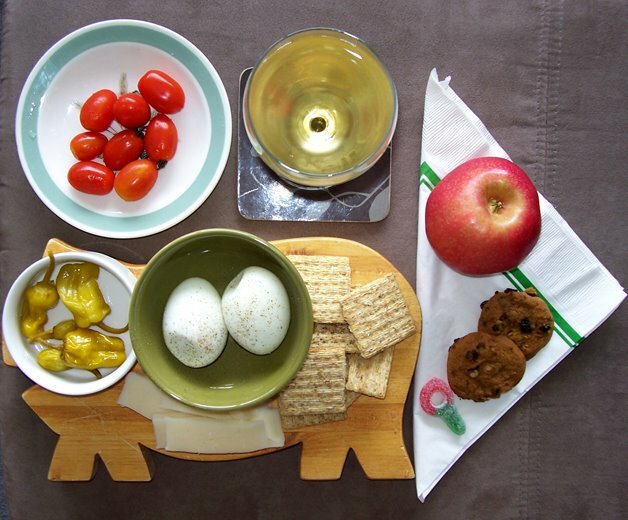 It consisted of two hardboiled eggs (lightly salted and peppered), some Triscuit crackers with Swiss cheese, grape tomatoes, pickled hot peppers, a glass of white wine (a nice Reisling from Ontario) and for dessert a 'pink lady' apple, two Lassy Mog cookies and...a sour key candy. Scrumptious! By the way, that's a pig-shaped cutting board I made in shop class in grade 8. I won't blame you if you find this revolting. But, you know what? It was actually really good! You are so cute, Andrew, how could anyone find anything about you revolting! As usual,your talent for design is evident in the way the food is artistically arranged and photographed. We wouldn't expect anything less! Aren't Pink Lady Apples the best!!! Yes, Carolyn, pink lady apples are delish! Not so good in baking, but on their own - yum! I'd love to have this for lunch! YUM! Some weeks ago I started a blog on my cooking. Feel free to have a look.